I was sorting through the clothes in my closet recently and realized I am definitely in need of some new items for this spring and summer. 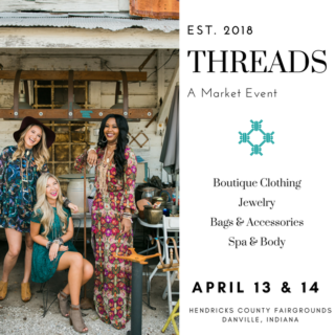 That&apos;s why I hope to check out Threads Market, a new boutique shopping event April 13 & 14 at the Hendricks County 4-H Fairgrounds and Conference Complex in Danville, Indiana. One thing I definitely need is a maxi dress for a wedding I am attending in May. I know I also need a few new pairs of shorts for the warmer months. Other warm-weather essentials available at the event will include boho tops, rompers, strappy sandals, jewelry, statement bags and more from more than 40 vendors from Indiana and Illinois. Vendors include local boutiques Brick & Belle, Caroline&apos;s, Michele&apos;s and Younique Culture. This sounds like a great girlfriend getaway. I just might have to see if a few friends will go with me to the Threads Market. They will have food available for purchase at the event and a cash bar with wine and Sun King beer. Becky&apos;s Urban Flower Farm will also have fresh stems available for customers to make their own bouquets on the spot. What a fun event for a girls&apos; night (or day) out! For more information, visit @threadsmarket on Facebook or call Urban Farmchic at (765) 245-2015. Where: Hendricks County 4-H Fairgrounds & Conference Complex, 1900 E. Main St., Danville, Indiana. Vendors will be in both the North/South Halls and Hendricks Power Expo Hall. When: 5-10 p.m., April 13 and 9 a.m.-3 p.m. April 14. Cost: $5 per person at the door each day. Children 12 and under are free.